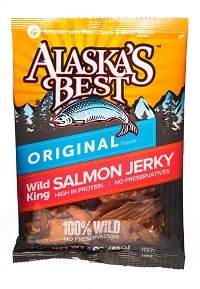 Alaska's Best Wild Salmon Jerky! Select 3, 6, 12, or 24 packages of 3 oz each per order. Choose Regular Peppered or Teriyaki. From Anonymous of Anchorage, Alaska on 10/14/2017 . From Anonymous of Nice, France, Georgia on 12/8/2013 . From Mike Christensen of Keewatin, Ontario on 9/22/2013 . From Michael Bourgeois of Houma, Louisiana on 2/8/2011 .